Battery Type: 3.6 V Lithium - AA. User replaceable. To activate the sensor, press on the ConceptOne label for less than five seconds to activate the hidden smart switch. To de-activate the sensor, press on the ConceptOne label for more an five seconds. 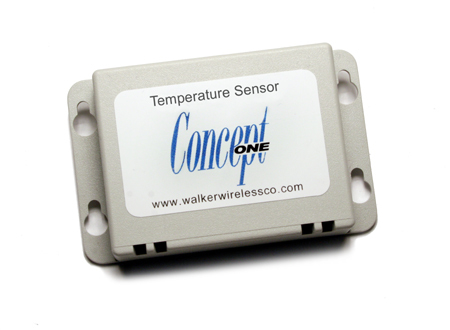 The ConceptOne Temperature Sensor is a battery operated digital temperature sensor with a built-in microprocessor controlled 418 MHz FCC certified radio transmitter. This extremely small sensor, measures only 2.0" x 2.5" x 1.0" (including mounting flange) and weighs only one ounce. Our complete wireless network costs less than just the electrical wiring for other systems.